Henry H. KNAPP was born 30 Sept 1883 in Randolph Township, Portage County, Ohio. He was the son of John KNAPP and Elizabeth SCHROEDER – and the great-grandson of our immigrant ancestor, Franz Adam KNAPP. Henry grew up on a farm in Randolph Township, Ohio. He was also a twin! Henry KNAPP, along with twin brother, Willie, is listed on the 1900 Census as being 16 years old and living on the family farm with their parents, John and Elizabeth KNAPP. Sadly, two other siblings, a sister, Mary, born in 1870, and a brother, Francis, born 28 Oct 1879, had both died young, during the month of June 1881. I haven’t found their death certificates yet, but I suspect their deaths were probably due to some infectious disease that was making the rounds of the area at the time. Little Francis, age two, died 17 June 1881, and his older sister, Mary, followed him on 29 June 1881. Henry’s twin brother, William Bernard KNAPP, was born on 30 Sept 1883 and lived in Randolph Township, too. “Willie” married Mabel Louisa MAY on 19 June 1906. Together, this couple had seven children: Marguerite, Mildred, Stanley, Clement, Maurice, Mercedes and Kathleen. “Willie,” as he is named on the 1900 Census, died 20 Nov 1950, at the age of 67 of a coronary thrombosis (blood clot/heart attack). By 1920, Henry was still single – in fact, he never married. Perhaps that’s one of the reasons he had extra time to devote to being a member of the St. Joseph band. He is shown on the 1920 Census as living on the family farm with his widowed mother, Elizabeth. His father had died in 1915 after a six-month illness due to cancer. John KNAPP was buried on Christmas Eve in St. Joseph Cemetery in Randolph. His wife, Elizabeth, would pass away on 28 Dec 1929. She, too, is buried in St. Joseph Cemetery. Sadly, William’s twin brother, Henry, did not fare so well as his twin did. 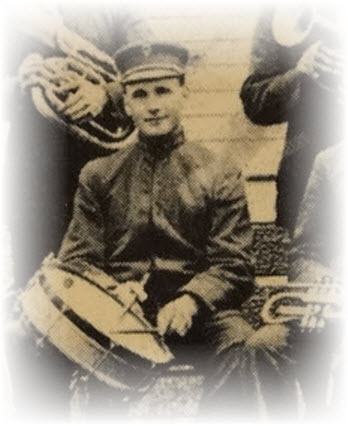 By 1923, just 2o+ years after this photo of the St. Joseph Band was taken, Henry KNAPP was dead. On 17 June 1923, Henry fell ill and was admitted to Akron City Hospital. Doctors suspected appendicitis and decided to operate. Apparently, the surgery was too much for Henry, and he died on 19 June 1923 at 1:00 a.m. Apparently, Henry’s appendix had become severely infected and inflamed – and he did not have it removed in time to prevent his death. It had already turned septic and may have even burst, spreading toxins throughout his body. Remember: this was 1923 – well before the development of antibiotics. Penicillin didn’t become available until sometime during WWII. Henry didn’t have a chance against septic shock following a burst appendix. Henry KNAPP was only 36 years old. He was laid to rest in St. Joseph Cemetery in Randolph on 21 June 1923. This entry was posted in Family History, Knapp, Local History, Schroeder, St. Joseph Band, St. Joseph Randolph and tagged Francis Knapp, Henry Knapp, John Knapp, Mary Knapp, William Knapp. Bookmark the permalink.